After winning 5-of-7 games against the Pirates and Astros during their latest home-stand, the first place Reds are off to St. Louis to play the Cardinals. The Reds are currently one game ahead of the Cardinals in the NL Central standings and own the best record (30-21) in the National League. This weeks three-game series against the Cardinals will be the last time the division rivals face-off until August 9-11 in Cincinnati. "We’re having fun," Reds owner Bob Castellini says. "We’re having a lot of fun." The Reds' recent success has been a result of coordination. The Reds' offense has been rampant (leading the majors in home runs with 67) while the starting pitchers haven't received a loss in over two weeks. With the Reds' most dominant player Joey Votto sidelined with a stiff neck, veteran Miguel Cairo has been replacing the damage. When Homer Bailey was placed on the 15-day disabled list, Sam LeCure stepped in and secured the mound. This vibrant group of players is enjoying success and defining unity. They are a true team. "With this team, everybody contributes every night," Aaron Harang said. 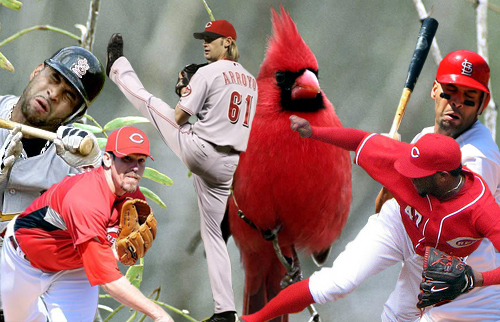 Bronson Arroyo (5-2, 4.30) will face Jaime Garcia (4-2, 1.14) and the Cardinals at 4:15pm on Monday.